Accommodation describes the work your eyes do to focus as you look at near objects or text. It is a reflex action, one that happens automatically as you bring something nearer. Tiny muscles in the eye respond to prompts from the brain and your focus shifts as needed. As you get older accommodation becomes harder and you may need reading glasses. Anisometropia occurs when you have a different prescription in each eye. Many people have one eye that is more long or short sighted than the other without it causing any issues. With a larger difference between the eyes, your dispensing optician may need to make adjustments to the lenses they dispense to give you the best vision, especially if you need varifocal lenses with a different prescription for distance and near. 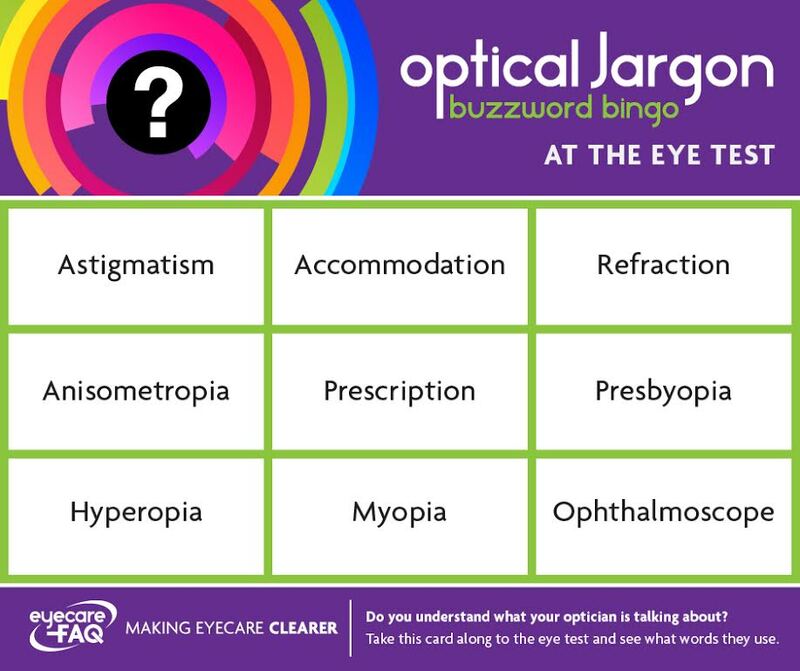 Astigmatism is very common and generally nothing to worry about. It describes when the eye is rugby ball shaped rather than round. The majority of people have a small degree of astigmatism which causes no problems. If you wear glasses, you can be long or short sighted and also have astigmatism. The astigmatism will be taken into account in your spectacle prescription. A higher degree of astigmatism can cause blurred vision and you will need to wear glasses to correct it. It can occur in one or both eyes. Hyperopia is another word for long-sightedness. For some people this may mean that you struggle to see things close up, while for others it must means that their eyes have to work extra hard to focus on near work. Long-sightedness in young children can be associated with squint or lazy eye. Myopia is another word for short-sightedness. People who are myopic struggle to see things at distance. With high myopia you may only be able to see clearly a few centimetres in front of you. This can be remedied with glasses, and many myopes also like contact lenses. The ophthalmoscope is an instrument the optometrist uses to examine the inside of your eyes. By looking through the pupil and adjusting the focus of the ophthalmoscope they can get a clear view of the retina and the blood vessels that the back of the eye. This gives them a clear view on potential eye health problems, and also shows up some signs of conditions like diabetes and high blood pressure. Presbyopia describes something that happens to all of us as we get older. If you are in your forties you may notice that it is getting harder to see small print – or that you need to hold it further away to see it. This happens at different ages for different people. It is part of the normal aging process as the crystalline lens inside the eye becomes less flexible and cannot flex to focus up close. Almost everyone will need reading glasses which help you see small print clearly again. Talk to your dispensing optician about what to do if this is happening to you. Don’t be tempted to simply buy ‘off the peg’ reading glasses as your forties is the age when the risk of eye disease increases. An eye test doesn’t just check if you need specs: it is also a vital health check for your eyes. Your spectacle prescription is the numbers that describe the power of spectacle lenses that will give you the best vision. After the optometrist has completed the eye examination they will write your prescription for you. It may have different numbers for close and distance vision, and sometimes for intermediate vision too depending on your work and hobbies. Don’t worry if you don’t understand your prescription: the dispensing optician can discuss what it means with you, and help you select the right lenses and frames for optimums vision. Refraction describes the part of the eye test were the optician puts different lenses in front of your eyes to work out which will help you see best. They may shine lights into your eyes to estimate the prescription needed. They might get you to look at a letter or shape chart then ask questions like ‘better or worse?’ to check your responses. Don’t worry if you are unsure of think you have given a wrong answer as they will check using stronger and weaker lenses in turn before finding the optimum prescription.